The weekend always goes by so fast, so I have some delicious time-saving recipes from our forum (shown below) for you to enjoy. These dishes are easy to whip together with just a few ingredients. 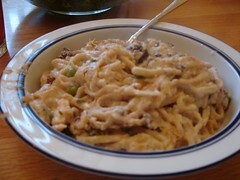 First, I have a secret recipe for a tasty chicken tetrazzini that is ready in about 30 minutes. This recipe is only one of the tried and true chicken recipes featured in the “300 Chicken Recipes” cookbook. This essential collection of mouthwatering chicken recipes has everything from casseroles to appetizers to pot pies, and more. Eliminate Agonizing Back Pain In Just 17 Minutes! Boil noodles in salted water for 8 minutes. Combine noodles, soup, cheese, mushrooms and chicken in a bowl. Stir in sour cream. Place in a greased baking dish and bake at 350 degrees for 30 minutes. Before serving, stir in a bit more cheese.